Reading that headline and if you’re anything like us you won’t know whether to laugh or be slightly alarmed. It raises several questions: namely, why was a monkey at a bar, why the hell was he drunk and who gave him the kitchen knife? Well as amazing as the scenario sounds, this is a new story that we have come across originating from Patos, Brazil last month. Firefighters were called to the bar because the monkey had started becoming aggressive. The drunk monkey had already downed a glass of rum before the emergency services arrived. In a fit of rage the monkey had armed himself with a kitchen knife, and was brandishing the weapon to the other patrons. The local fire department in Patos, Paraiba, told local news sources that they had received the call stating that an aggressive monkey with a kitchen knife was chasing people around a bar. Fire deparment Lt. Col. Saul Laurentino said that after drinking the rum, the monkey only chased the men in the bar with his knife. The women were left alone. “It was a bar staff oversight that ended with the monkey drinking some rum and taking the knife,” Laurentino told the aRede website. 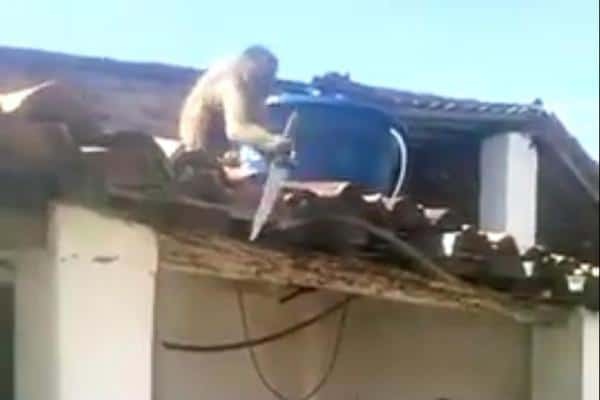 Captured video has been making the rounds on youtube, showing the monkey using the kitchen knife against the bar’s roof in a demonstration of his anger. The firefighters managed to capture and subdue the monkey before releasing him back into the wild. However, the rum clearly had not worn off in time because later reports came that the drunken monkey was acting aggressively toward residents of homes near the woods. The firefighters were once again called and captured the monkey. Local authorities said they were keeping hold of the little devil while they determined whether he will be released again or be checked in for some anger management counselling.